The Huia, (IPA: [hui?]) (Heteralocha acutirostris) was a species of New Zealand Wattlebird endemic to the North Island of New Zealand. It became extinct in the early 20th century, primarily as a result of overhunting and widespread habitat destruction, and partially due to collection for museums. The last confirmed sighting was on 28 December 1907 when W.W. Smith saw three birds in the Tararua Ranges. Further credible sightings were reported as late as 1922. The Huia was notable for a remarkable degree of sexual dimorphism in bill shape. The male and female had markedly different bills, although the sexes were otherwise similar with predominantly black plumage with a green sheen, and orange wattles. Forested areas were the preferred habitat, with birds descending to lower altitudes in winter. The Huia's diet was made up of insects and spiders, the male using its bill to chisel away at wood while the female's longer bill was able to probe deeper areas. The Huia held a special place in M?ori culture and oral tradition; the bird was regarded as tapu (sacred), and the wearing of its skin or feathers was restricted to people of high status. Australian ornithologist John Gould described the Huia in 1837. The specific epithet acutirostris derives from Latin acutus, meaning "sharp pointed", and rostris, meaning "beak", and refers to the beak of the female. With its short bill, the male was first described as a separate species with the epithet crassirostris from the Latin crassus, meaning "thick" or "heavy". The Huia appears to be a remnant of an early expansion of passerines in New Zealand and is one of three New Zealand wattlebirds of the family Callaeidae, the others being the endangered Tieke, or Saddleback, and the K?kako. New Zealand Wattlebirds have no close relatives apart from the Stitchbird, and their taxonomic relationships to other birds remain to be determined. The Huia had black plumage with a green metallic tinge and distinctive rounded bright orange wattles at the gape. In both sexes, the beak was ivory white and greyish at the base. The legs and feet were long and bluish grey while the claws were light brown. The eyes were brown. The bird had twelve long glossy black tail feathers, each tipped for 2.5–3 cm (1 in) with a broad band of white. The immature Huia had duller plumage that was covered in brown and the white tips of the tail feathers were tinged a reddish-buff colour. The wattles were small and pale. The beak of the young female was only slightly curved. M?ori referred to certain Huia as huia-ariki—literally "chiefly Huia". The huia-ariki had brownish plumage streaked with grey, and the feathers on the neck and head were darker. This variant may have been a partial albino, or perhaps such birds were simply of great age. Several true albino Huia were recorded. Although sexual dimorphism in bill shape is found in other birds such as the riflebirds and sicklebills, it was most pronounced in the Huia. The beak of the male was short at approximately 60 mm (2.3 in) and slightly arched downwards and robust, like that of a woodpecker, while the female's beak was finer, longer at around 104 mm (4 in), and curved downward like that of a hummingbird or honeyeater. Another, less obvious aspect of the Huia's sexual dimorphism was the size difference between the sexes. Males were 45 cm (18 in) long, while females were larger at 48 cm (19 in) in length. Additionally, the tail of the male was about 200 mm (.78 in) in length and the wingspan was between 210 and 220 mm (8.2-8.6 in), while the female's tail was 195 to 200 mm (7.6-7.8 in) and the female's wingspan was 200 to 205 mm (7.8–8 in). The Huia mainly inhabited the mountainous regions throughout the North Island from Northland to Wellington where the subfossil and midden remains have been found. Its range appears to have contracted following M?ori settlement. By the time of European settlement in the 1840s, the bird was found only in the forests of the southern North Island south of a line from the Raukumara Range in the east, across the Kaimanawa Range to the Turakina River in the Rangitikei in the west. In the south its range extended to the Wairarapa and Rimutaka Range east of Wellington. Reports collected by Walter Buller and a single waiata (M?ori song) suggest that Huia were once also found in the Marlborough and Nelson districts of the South Island; however, there is no other evidence of the species' presence. The Huia inhabited hardwood-podocarp forests where there was a dense understorey, and occasionally also Nothofagus forest. It may have moved depending on the season between montane and lowland forest. It was observed in native vegetation including mata?, rimu, kahikatea, northern r?t?, maire, hinau, totara, rewarewa, mahoe, and taraire, and at sea level in karaka trees at Cape Turakirae. It was never seen in burnt forest or land cleared for farming. Like the surviving New Zealand wattlebirds, the saddleback and the kokako, the Huia used its rounded wings to fly short distances, but preferred to use its strong legs to move in long leaps and bounds through the canopy or over the forest floor. The tail was spread to help the bird balance as it clung vertically to tree trunks. A quiet, social bird, the Huia was monogamous with pairs bonding for life. The bird was usually found in breeding pairs, although sometimes groups of four or more were encountered. Walter Buller records that a pair would always keep close to each other, constantly uttering a "low affectionate twitter", even when in captivity. He also observed that a pair he held in captivity would frequently groom each other. When the male of this pair was accidentally killed, the female "manifesting the utmost distress pined for her mate and died 10 days afterwards". A M?ori man in the 19th century recalled that "I was always told by my old people that a pair of Huia lived on most affectionate terms... If the male died first the female died soon after of grief". The bird was named for its loud distress call, a smooth, unslurred whistle sounding like the words "Who-are-you-o". If this call was imitated, the bird would come to investigate. The Huia had no fear of people, and therefore could be captured easily by hand. Females also allowed themselves to be handled on the nest. An imitation of the bird's call survives as a recording of 1909 Huia Search Team member Henare Haumana whistling the call. A species of phtilopterid louse has been described from the Huia. 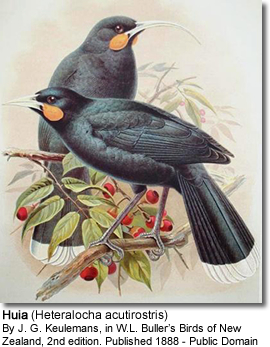 Rallicola extinctus, formerly considered the only species of a separate genus Huiacola ("Huia inhabitant"), was only known to live on the Huia and apparently became extinct with its host. The Huia mainly inhabited the mountainous regions of the North Island, descending in winter or in periods of cold weather to lowland forests on the plains to forage for food. It was considered a specialist predator of the nocturnal huhu beetle larvae, which were its preferred food, but it also ate other insects and their larvae, including weta, as well as spiders and small berries. It took insects and spiders from decaying wood, from under bark, mosses and lichens, and from the ground. It foraged alone, in pairs or in small flocks of up to five which were probably family groups. The sexual dimorphism of the bill structure gave rise to feeding strategies that differed radically between the sexes. The male used its bill to chisel into the outer layers of decaying or live wood, whereas the female probed areas inaccessible to the male, such as the burrows of insect larvae in living wood. Studies of the anatomy of the male head and neck musculature also suggest that the male was capable of "gaping", which involved the bird inserting its bill into rotting wood to split the wood. Once the Huia had secured a meal, the bird flew to a perch with the insect in its feet. The Huia stripped its meal of any hard parts, then tossed the remainder up and, catching it with its bill, swallowed it. A pair did not cooperate in feeding, at least not in a strict sense. All such reports are based on misunderstanding of an account by Buller, which referred to a pair kept in captivity. Rather, the divergent bills represent an extreme example of niche differentiation, by which intraspecific competition between the sexes was reduced. This allowed the species to exploit a wide range of food sources. Little is known about the Huia's reproduction; however, the breeding season was thought to be early summer, when the birds constructed a saucer-shaped nest of dried grass, leaves, sticks and twigs with a small, shallow central cup made of soft materials to cushion and insulate the eggs. The nest was built either in a hollow tree or in a mass of dense vegetation. Nesting took place in November. The clutch size was two to four eggs, which were greyish with purple and brown speckles and measured 45 by 30 mm (1.8 by 1.5 in). Most Huia nests were found near the summits of mountain ranges. In M?ori culture, the "white heron and the huia were not normally eaten but were rare birds treasured for their precious plumes, worn by people of high rank". The bold and inquisitive nature of the Huia made it particularly easy to capture. M?ori attracted the Huia by imitating its call and then captured it with a tari (a carved pole with a noose at the end) or snare or killed it with clubs or long spears. Often they exploited the strong pair bond by capturing one of a pair, which would then call out, attracting its mate which could then be easily captured. Although not usually hunted for food, the Huia was considered excellent eating. Although the Huia's range was restricted to the southern North Island, its feathers were valued highly and they were exchanged amongst tribes for other valuable goods, such as greenstone and shark teeth, or given as tokens of friendship and respect. Through this trade, the feathers reached the far north and the far south of New Zealand. They were stored in intricately carved boxes called waka huia which were hung from the ceilings of chief's houses. Huia feathers were worn at funerals and used to decorate the heads of the deceased. The marereko, described by Edward Robert Tregear as an 'ancient war-plume', consisted of twelve Huia feathers. The p?hoi, an ornament made from the skin of the Huia, was highly valued. The bird was skinned with the beak, skull and wattles attached, while the legs and wings were removed. The skin was carefully dried and the resulting p?hoi ornament was worn from the neck or ears. Dried Huia heads were also worn as pendants called ngutu huia. A captured Huia would be kept in a small cage so that its tail feathers could be plucked as they grew to full size. The bird was also kept by M?ori as a pet, and like the Tui, it could be trained to say a few words. There is also a record of a tame Huia kept by European settlers in a small village in the Forty-mile bush in the 19th century. New Zealand and the Cook Islands have released several postage stamps portraying the Huia and the New Zealand sixpence circulated from 1933 to 1966 featured a female Huia on the reverse. The Huia occurred throughout the North Island before humans arrived in New Zealand. The M?ori arrived around 800 years ago and by the time European settlers arrived in the 1840s habitat destruction and hunting had reduced the bird's range to the southern North Island. However, M?ori hunting pressures on the Huia were limited to some extent by traditional protocols. The main hunting season was from May to July when the bird's plumage was in prime condition, while a r?hui (hunting ban) was enforced in spring and summer to allow the species' numbers to recover. It was not until European settlement that the Huia was truly threatened. Its numbers began to decline due to three factors: widespread deforestation, introduction of mammalian predators, and overhunting. Another possible cause of extinction is disease, but, like the extinctions of other New Zealand birds in the 19th century, such as the Piopio, the decline of the Huia was poorly studied. Because it spent a lot of time on the ground, the Huia would have been particularly vulnerable to mammalian predators, especially ship rats, cats, and mustelids. In the 19th century, massive deforestation occurred on the North Island, particularly in the lowlands of southern Hawkes Bay, the Manawatu and the Wairarapa as land was cleared by European settlers for agriculture. The Huia was particularly vulnerable to this because it appeared that it could only live in old growth forest where there were plenty of rotting trees filled with insect larvae. It seems it could not survive in regenerating secondary forests. Although the mountainous part of their former range was not deforested, the lowland forests of the valleys below, where Huia took refuge in winter and cold weather, were systematically destroyed. Habitat destruction and the predations of introduced species were problems faced by all New Zealand birds, but in addition to these the Huia faced massive pressures from hunting. Huia were sought after as mounted specimens by collectors and museums all over the world, who were interested in its pronounced sexual dimorphism and its beauty. The hunting of Huia for this purpose was initially done by naturalists. Austrian taxidermist Andreas Reischek took 212 pairs as specimens for the natural history museum in Vienna over a period of 10 years and Walter Buller collected 18 in just one of several expeditions to the Rimutaka ranges in 1883. However, others keen to profit from the decimation of the species soon joined in. Buller records that in 1883, a party of 11 M?ori obtained 646 Huia skins from the forest between the Manawatu Gorge and Akitio. Ultimately several thousand Huia were exported overseas as part of this trade. There was a sharp decline in numbers of the birds in the 1860s and in the late 1880s the chiefs of the Manawatu and the Wairarapa placed a r?hui on the Tararua range to prevent the killing of the bird. In February 1892, the Wild Birds Protection Act was amended to include the Huia, making it illegal to kill the bird; however, enforcement was not taken seriously. A recommendation was also made that island sanctuaries be set up for endangered native birds; however, the new bird sanctuaries, such as Kapiti Island and Little Barrier Island, were never stocked with the Huia. A live pair destined to be transferred to Kapiti in 1893 was instead appropriated by Buller, who bent the law to gain permission to take them to England. The visit of the Duke and Duchess of York, later King George V and Queen Mary, to New Zealand in 1901 was celebrated throughout the land and at an official M?ori welcome in Rotorua a guide took a Huia feather from her hair and placed it in the band of the Duke's hat as a token of respect. Soon many people in England and New Zealand wanted to emulate this royal fashion and wear Huia feathers in their hats. The price of feathers was soon pushed to one New Zealand pound each and some sold for as high as five pounds. 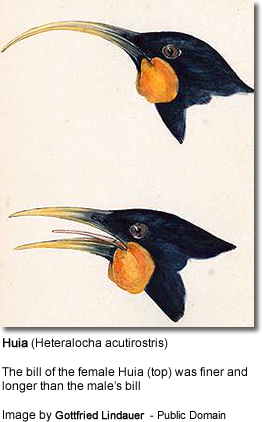 Female Huia beaks were also set in gold to create jewellery such as brooches. Shooting season notices ceased listing the Huia as a protected species in 1901 and a last-ditch attempt to reinforce government protection failed when the Solicitor General ruled that there was no law to protect feathers. The last official sighting was on 28 December 1907 when W.W. Smith saw three birds in the Tararua Ranges; however, unconfirmed reports after this date suggest that extinction came a little later. A man familiar with the species reported seeing three Huia in Gollans Valley behind York Bay (between Petone and Eastbourne, Wellington) on 28 December 1922. Sightings of the Huia were reported here in 1912 and 1913 and this area of mixed beech (Nothofagus) and podocarp forest was well within the bird's former range. Despite this, naturalists from the Dominion Museum in Wellington did not investigate the reports. The possibility of a small Huia population still existing in the Urewera ranges has been proposed by some researchers, but is considered highly unlikely. No recent expeditions have been mounted to find a living specimen. The Huia had been little studied by naturalists before it was driven to extinction. Students at Hastings Boys' High School organised a conference in 1999 to consider cloning the Huia, their school emblem. The Maori tribe Ngati Huia agreed, in principle, to support the endeavour, which would be carried out at the University of Otago, and a California-based Internet start-up volunteered $100,000 of funding. However, the curator of Te Papa, Sandy Bartle, believed the full Huia genome cannot be derived from museum skins due to the poor state of the DNA and cloning is therefore unlikely to succeed.